Helicopter over Baghdad vs. golf cart with Bush Sr: different ways to appear presidential. Dan Kaminsky explains what to do about the DNS patch … with his niece Sarah. According to Dan Savage, telling autistic children to “Straighten up. Act like a man. Don’t sit there crying and screaming, idiot” will help address the autism epidemic–leaving the question of why he was never told these things. Well, it looks like Jimmy dodged a bullet. An eyesore removed? We can only hope. Um, duh. I do wonder why stories like this hit when they do. Obama visits troops in Kuwait, makes a 3 point jumper on the first try. Is this an early description of Dan Kaminsky’s DNS flaw? 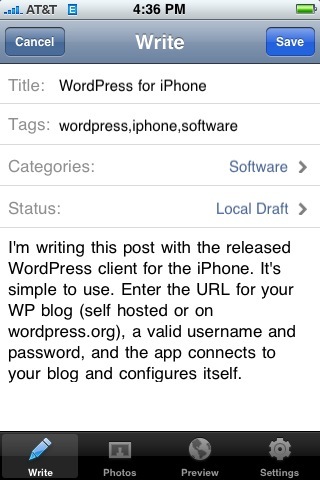 I’m writing this post with the released WordPress client for the iPhone. It’s simple to use. Enter the URL for your WP blog (self hosted or on wordpress.org), a valid username and password, and the app connects to your blog and configures itself. As you can see below, not only does the client support categories and tags, but photos as well. You can either incorporate an existing photo from your library or take a photo from within the app. the app only prompts for a password once–convenient, but a security risk. If you lose your iPhone, your blog is compromised. Overall, though, a killer 1.0 and a good way to really mobilize blogging. I look forward to giving the app a proper shakedown next week at Tanglewood. The UI for actually posting a post is a little non-intuitive. Rather than a big Publish button, you have to change the status of the post to Published, then save the post. This is probably so that you don’t hit the button with your thumb by mistake, but it’s still a little annoying. The publish process seems buggy. My post at first failed to publish–the app crashed–then published, without sending its image. To attach the screen capture, I resorted to emailing the photo to Flickr, then adding the URL to the post. Not trivial, and without copy and paste impossible to tie the photo back to the post without going to the computer. The photo thing is annoying. The crashes on posting are a big big problem.